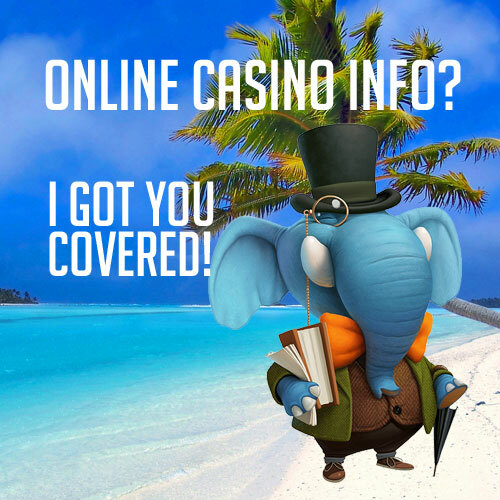 Welcome to Casino Phant – My name is Larry the Elephant and I aim to guide you through the jungle of online casinos. My biggest hobbies in life is to play casino (duh), paint canvases and eating. I can eat all day long, and I can’t count the times I’ve set the slot machine to Auto-Spin to run to the kitchen and grab my self a mid night snack. Enough about me and more about what you’re here for. You’re new to casino and looking for guidance, and I’m the teacher you’ve been looking for! Let’s start off with something easy shall we? When I turned 18 it took me about 6 hours before I entered a casino for the first time in my life. I just loved it. The smoky rooms (yes people were allowed to smoke inside the casinos back then), the fancy people and the thrilling casino games. I was hooked! There was only one problem with landbased casinos; my town did not have one, and I had to take the train 4 hours to London to find a decent one. But it did not take long untill my problem was solved; the online casino appeared! An online casino is basically a virtual casino you access though your web browser. Back when I first started playing online you had to download a program to play, but that’s not the standard anymore. There are many reasons why a lot of people, myself included, prefer online casinos over landbased ones. The main one for me is the accessability, I can play when ever, where ever. But there are other perks to playing online. You almost always get a sign up bonus and a deposit bonus which can double your money. This extends your bankroll quite a bit, which is nice to say the least. Casino bonuses – How do they work? I mentioned casino bonuses earlier didn’t I? Well, then I should explain them a bit more in detail I assume. A casino bonus is something extra you get when either registering or depositing at a casino. The bonus can consist of a few different things, but the most common are free bonus money, free spins on a slot machine and match bonus (also bonus money, but requires a deposit). All players have their favourite bonus, but I must admit that I love them all. Free bonuses work like this: You register an account at an online casino, and your free bonus is there waiting for you. Everything you win with your bonus (either free spins or money) you need to wager before a withdrawal is accepted. Deposit bonuses work like this: Desposit bonuses are just the opposite of free bonuses in a sence that you need to pay to play. When adding funds to your account the bonus will double (or more) your bonus. Just like before you need to wager your winnings, but it sure is a sweet deal anyways. Can I play online casino from my country? If you’re not certain if you’re allowed to play online casino from where you live, you’ve come to the right place. Here I’ll list countries and tell you if they are okey to play from or not. In the UK you’re more then welcome to play at online casinos. The government actually gets 15% tax from all the casinos gross winnings, so even if they would not say it out loud, they love online gambling. For most of US visitors, NO, you may not play online casino. It’s illegal in the US. How ever, if you’re living in New Jersey you may play online, and you have around 23 regulated and legal casinos to choose from. All green lights. Sure there are some talks about a “grey area in the law” when it comes to gambling online in Canada, but to be honest it’s quite black and white. As a player, you do NOT commit any crimes by playing slots online. Period. In 2017 the government changed some thing in the law, and to be honest it’s a bit of a limbo. A lot (and when I say a lot, I mean a lot) of casinos have withdrawn from Australia, being afraid it’s illegal to offer online games to OZ-folks. However, as a player I would not worry to much. As a casino though, that’s another thing. Good day Mate – Welcome to Casino Phant!